When I created Awan I knew I needed to have a tribe of fishermen because fish was an important part of the diet of the Eastern European, Ashkenazi, Jews. Being of Ashkenazic decent myself, I grew up eating fish for breakfast: cured salmon (lox), smoked whitefish, pickled herring, and during the Passover holiday, gefilte fish. So when I thought of a dish for the Dayag, a breakfast dish involving fish seemed appropriate. Since moving to the Pacific Northwest, I haven’t eaten lox, whitefish or herring as often. Usually these fish are reserved for holidays or bar and bat mitzvot, yet smoked salmon is a common Pacific Northwest dish. I decided to merge my heritage with my chosen home by creating a breakfast dish using smoked salmon. American Jews tend to eat their salmon on bagels, but because the Dayag don’t grow wheat, bagels were off the menu. Eggs on the other hand, that was another story. Of all egg dishes, one of my favorites is the frittata, an Italian dish that some people describe as an open-face omelet. 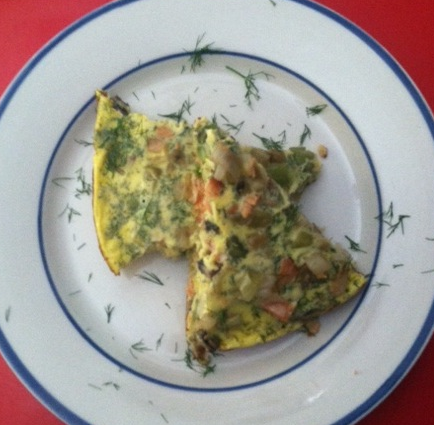 But unlike the omelet, frittatas are easy to make for multiple people, making it a great choice for a family. I also love the idea of playing with an Italian dish. Many Italian immigrants and Jewish immigrants moved to large cities and often lived in neighborhoods close to one another. Italian food became an important part of the American Jewish experience. As a child I probably ate more Italian food than I did Jewish food. Beat together eggs, add kefir and finely chopped dill. Set aside. Cut leeks in half and rinse under running water or soak in a bowl to clean dirt from inner layers. Slice leeks and asparagus into 1/4 inch pieces. Add about two tablespoons of oil to a preheated pan, add the leeks and asparagus and cover. Sweat the leeks and asparagus on low/medium heat for about 5 minutes. Meanwhile, slice mushrooms and crumble salmon. Add mushrooms, and salmon to leeks. Continue to sweat on low/medium heat for a few more minutes, until just soft. Do not let the vegetables to become brown or mushy. Season the egg mixture with a little salt and pepper (Taste the vegetables prior to seasoning the eggs since smoked salmon tends to be salty. If the vegetables are very salty, do not add much salt to the eggs.) Add enough oil to a preheated non-stick pan to just cover the bottom. Pour egg mixture into pan. Cook at medium/low for approximately one minute to allow mixture to begin to set. Add the vegetables and salmon to egg mixture, distributing evenly. Cover and cook over medium/low heat until fully set, approximately 15-20 minutes. Turn out onto a cutting board and cut into 8 pieces (pizza cutters work well). Garnish with dill. Serves 4 – 8. One wedge plus potatoes or a light salad is enough for one. We often just have two wedges and call it good.